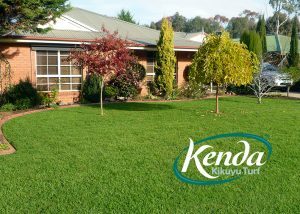 Kenda® Kikuyu is a fast-establishing lawn, that has been labelled as perfect for the busy Aussie family with kids and pets. Kikuyu’s® fast recovery rate means it is also often used for parks, sports fields, race courses and high foot traffic areas. The variety is suited for many regions across Australia, especially where there are cold winters where it maintains its attractive deep green colour. Kenda® also produces very little seed head, which is a common irritant to people and pets with allergies. While its lack of seed makes it less invasive than other Kikuyu varieties, Kenda® has a fast growth rate and is ideal for yards and gardens with hard edges.